There was a time not to long ago, when “Hunters” were considered a noble and important part of the community. The food they brought home fed the community. Hunters were the food delivery folks that shared and contributed to the welfare of all. Even today, Hunters should be recognized for all the public lands, greenways, and open spaces that have been paid for by Hunters fees, taxes, and licenses. Most joggers, tree huggers, and anti-hunters willingly use these open spaces, pay little or nothing, and openly hate hunters. Part of the problem are what Hunters do to themselves. Not everyone wants to hear about kill shots, gut piles, and the details that deer hunting involves. Considerate and responsible hunters must do a better job with our presentation and messages. Displaying dead carcasses, dumping butchered body parts along roads, shooting signs and displaying a “Bubba mentality” does not help. Honestly, I have rarely seen these poorly behaved “hunters”. Most of the hunters I encounter are part of a Brotherhood. What we usually see is evidence of vandalism, poaching, and trash left by slobs and deplorables that are not true hunters but are criminals. Talk about profiling. The rest of us “sportsmen” get the blame. The anti-gun community sees all weapons as a problem. Why hunt when they can purchase their meat at the grocery store cleanly wrapped in cellophane and Styrofoam trays. Our population of non-hunters sees food differently. They are insulated from the reality of life and death when it comes to meat and food. Their limited education about hunting and the environment is slanted and not supported by facts or science. On one occasion, I shared a venison loin and some steaks with a friend. Since I butchered, and vacuum sealed the meat, I knew the meat was perfect. As a hunter, I want to feed my family the tastiest and healthiest foods possible. This means wild game that has no antibiotics and harmful chemicals in it, oh and is “organic” and “free range”. When I share this meat with a friend, I share the same love with them. My friend’s wife fed the prime venison to her dogs! Just the price per pound of venison is probably twice of the best primo steak available. Hunting is not cheap. I even shared a few great and easy recipes for them to try. Now I love dogs too, but my pups do not get to eat venison loins. “How can you kill such a cute and beautiful creature?” My friend’s wife liked me but always put me down for being hunter. Our culture has changed, and I am pretty sure that we may see the end of hunting in our near future. Baby Boomers may be the last generation of hunters. The thing about deer hunting I will miss has nothing to do with deer. I will miss the friendships, camps, meals, and stories that brought hunters together. Deer were simply the excuse to be part of a Brotherhood. Deer are also wonderful to eat. If you have never harvested a deer, you will never understand the joy, satisfaction, and excitement that comes with it. This may sound terrible, but deer hunting is a blood sport. Being blooded after a first kill is a rite of passage. Hunters love deer more than non-hunters. We give thanks for the blessing of healthy food and sport. This renewable resource is special and a wonderful part of a hunter’s healthy life. It has been this way for every culture throughout time. Hunters harvested wild game is tastier and more ethical than commercial meat markets. Cows, pigs, and birds all are cute, cuddly, and tasty. It is ok to choose items from a menu that we prefer. Hunters prefer wild, organic, ethically, and legally harvested wild game. Hunting and fishing are sports that many more kids could enjoy. Celebrating the outdoors is a great way to deal with life’s challenges. These sports are about safety, limits, skills, patience, rules, right, wrong, life and death, oh and you can bring home the groceries. Sitting in a tree stand waiting for a big buck is way healthier and better than sitting on a sofa waiting to win the next level of a violent video game. Hunting is not a women’s sport but that is changing. Women are becoming hunter’s in increasing numbers. Shooting, hunting, and gathering are all in the human DNA. We are all Hunters and Gatherers. Mom’s and daughters can enjoy hunting for dinner and being good sports with their family and friends. The sad truth is that the Earth is becoming a smaller place. At some point, hunting will end. Wild deer will be found in zoos or special parks. The choice of feeding our families wild and healthy foods will be gone. 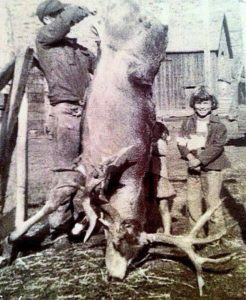 The last generation of old hunters will tell their stories about their days spent at deer camp. With their passing, the hunter’s legacy will be at an end. Within our lifetime, we need to celebrate and preserve our sport, if we can. Mentor new hunters. Share the positive values and stories about hunting. We only have so many seasons on our lives. Hunt Hard and Hunt Longer!